Resources for each unit include a Lesson Guide, Transparencies (can also be used with a document, designed to support full group discussions), Worksheets* (for in-class use), Homework, Classroom Poster**, Student Poster (with blanks to be filled in by the student), and a Completed Poster. Each of the above modules also contains the Guide Introduction for the complete curriculum. *NOTE: The dimensions of the worksheets may change slightly when you print and copy on your printer and copier, and the result may be an inexact fit of Cuisenaire rods to worksheets. We suggest that you print and copy a test copy of each worksheet that uses rods (denoted by the "RODS" logo in the upper right) to verify that the correct rods fit between tickmarks (see answer keys for specific colored rods). You may find that you need to enlarge (or reduce) your copier settings slightly so that rods fit; for example, try slight adjustments like 105% or 106% enlargement. 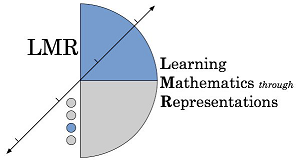 Institute of Education Sciences grant to Geoffrey B. Saxe (R305B070299 and R305B090026) funded the development of the Learning Mathematics through Representation (LMR) curriculum and associated research. The opinions expressed in the publications and curriculum materials are those of the authors and do not represent views of the Institute of Education Sciences or the U.S. Department of Education. We are grateful to the teachers and students who participated in the research, and to the many faculty and graduate students who contributed to the project. Former Graduate Student Researchers (UC Berkeley) who participated in the development and/or research on LMR. Saxe, G. B., Sussman, J. (in preparation). Mathematics learning in language inclusive classrooms: Supporting the achievement of English learnings and their English proficient peers. Learning Mathematics through Representations. (2014, October). Alignment of the Learning Mathematics through Representations curriculum with the Common Core State Standards. Unpublished manuscript, Graduate School of Education, University of California, Berkeley. Gearhart, M., Leveille Buchanan, N., Collett, J., Diakow, R., Kang, B., Saxe, G.B., McGee, A. (2014). Identifying opportunities to learn in mathematics discussions in heterogeneous eementary classrooms. Unpublished manuscript, University of California, Berkeley. Leveille Buchanan, N., Collett, J., McGee, A., & Gearhart, M. (2014). Teachers’ orientations to a curriculum-supported pedagogical practice in mathematics. Unpublished manuscript, University of California, Berkeley. Gearhart, M., Saxe, G. B., Earnest, D., Haldar, L. C., McGee, A., & Sitabkhan, Y. (2015). Embedding formative assessment in curriculum design: A research-based approach. Annual Perspectives in Mathematics Education (APME) 2015: Assessment to Enhance Teaching and Learning (pp. 219-231). Reston, VA: National Council of Teachers of Mathematics. Saxe, G. B., de Kirby, K. Le, M., Sitabkhan, Y., & Kang, B. (2015). Understanding learning across lessons in classroom communities: A multi-leveled analytic approach. To appear in A. Bikner-Ahsbahs, G. Kaiser, N. Presmeg (Eds.) Doing (qualitative) research: Methodology and methods in mathematics education. ZDM research handbook series: Advances in Mathematics Education. pp. 253-318.New York, NY: Springer. Gearhart, M., & Saxe, G. B. (2014, April). Differentiated instruction in shared mathematical contexts. Teaching Children Mathematics, 20(7), 426-435. Saxe, G. B., Diakow, R., & Gearhart, M. (2013). Towards curricular coherence in integers and fractions: The efficacy of a lesson sequence that uses the number line as the principal representational context. Special Issue (Classroom-based interventions in mathematics education). ZDM: International Journal of Mathematics Education, (45)(3), 343-364. DOI 10.1007/s11858-012-0466-2. Saxe, G. B., Shaughnessy, M., Gearhart, M., & Haldar, L. C. (2013). Coordinating numerical and linear units: Elementary students' strategies for locating whole numbers on the number line. Mathematical Thinking and Learning, 15, 235-258. Pfotenhauer, J., Kleine, R., Sitabkhan, Y., & Earnest, D. (2013, May). Shifting understanding of mixed numbers. Teaching Children Mathematics, 19(9), 592. Saxe, G. B., Gearhart, M., Shaughnessy, M. M., Earnest, D., Cremer, S., Sitabkhan, Y., Platas, L. M. & Young, A. (2009). A methodological framework and empirical techniques for studying the travel of ideas in classroom communities. In B. Schwartz, T. Dreyfus and R. Hershkowitz (Eds. ), Transformation of knowledge in classroom interaction (pp. 203-222). New York, NY: Routledge. Saxe, G. B., Shaughnessy, M. M., Shannon, A., Garcia de Osuna, J., Chinn, R., & Gearhart, M. (2007). Learning about fractions as points on a number line. In W. G. Martin, M. E. Strutchens, & P. C. Elliott (Eds. ), The learning of mathematics (pp. 221-238). Reston, VA: National Council of Teachers of Mathematics.